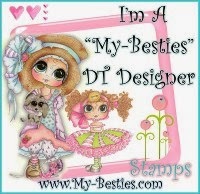 Welcome to my little creative space on the web where I can share my love of stamping and scrapping. I wanted to post a message to my online friends to let them know that on September 24th my beautiful daughter was killed in a car accident on her way to school. I'm sorry that it took so long to post this but saying the words meant that it would be real and I just wasn't ready to face that yet. I have received some emails and I know that I have not responded to them as of yet but please know that I appreciate all of the kind words and prayers. Cindy was only 23 and going to school to be a RN. She was probably the kindest, gentle soul that I know and it's still hard for me to believe that she's not here with me. Her service was absolutely beautiful and that provided some comfort. I spoke with the pastor for some time during the week before her service. He was very kind and just sat and listened to different stories about Cindy and her life. Alot of those stories were used in her service. That I am very grateful for. I'm doing better, not good just better. I miss her smile and her "I love you momma's". I know that I'm a strong person and will make it through this but there is one very good lesson to be learned here and I know it's been said a million times. Make the most of each day with your children. Let them know everyday how much you love them. I know I did that with Cindy and I don't doubt for a second that she knew this beyond a shadow of a doubt but I still see people around me that don't. They assume they have all the time in the world and you just never know. Rest in Peace my sweet baby girl. You were an Angel here on Earth and now your one of God's Angels. I love you so much. I'm terribly sorry for your lost and I can't imagine how you feel but she is definitely singing with the angels. She was beautiful and I'm sure you were proud to be her mom for 23 years. May some peace and healing be headed your way. I can't imagine the pain of losing one's child. I know she will be with you always. I don't know if I could carry on....big hugs for you in the days ahead. Forgive me for being so late in responding I haven't been home. My prayers will be with you and your husband and family members. Julie I am so sorry ! Your daughter is beautiful I can't not even imagine the emptiness you must feel my heart goes out to you. My thoughts and prayers are with you as you attempt to start healing. The unimaginable has happened to you. Be patient and kind to yourself. Cherish those wonderful memories of her. I am so sorry for your loss. My thoughts and prayers are with you and your husband. I admire your strength in dealing with this great loss, your daughter would be proud of you. Precious Julie, I know the pain you are going through right now as I too lost a child tragically. There are no words that can make you feel better, only working through your grief can heal. I am so sorry for you loss Julie. Loosing a child can't be easy, but remember that your daughter will always be with you in your heart and in so many precious memories. They say when you find a penny in places they should not be in, an angel has put it there for you. You and your family are in my thoughts and prayers. May you heart have peace and happiness soon. I am so sorry for your loss.. I have 3 daughters and cannot even imagine your pain right now.. I hope that you can hold on to those special days and moments for some peace. I also hope that you can find time for stamping.. Your work is amazing.. Hugs. Once again I want to tell you that I'm so sorry for your loss. Your daughter was beautiful. There are no words that can make you feel better just be patience and take one day at a time. Don't force yourself to do anything you are not ready. As you know I loss my only daughter too a few years ago and God is the only one can give you strength to continue. Have Faith! Hi Julie. I popped in to take a look at your Magnolia card and like it so much I decided to look around a bit. I really love what I've seen! You have a great talent and an eye for lovely design. And your coloring tain't too shabby either!! I just had to let you know how sorry I am for your loss of your beautiful daughter. Tears are stuck in my throat right now. I lost my oldest son when he was 15. That's been many years ago now, but it's something that just stays with you. I hope you find support and love from family and friends, and comfort in your memories of Cindy. Bless you dear!! A lot...more than a lot of love your way. Huge hug.